With so many diet plans around, it’s confusing which one to choose. In this article, we will discuss paleo and vegan diet. The debate is ongoing on which one is healthy? To get an answer, let us learn about both the foods and the difference between them so that you can choose the one that supports your lifestyle and all over health. A vegan diet is about consuming food from plant sources such as fruits, vegetables, grains, nuts, seeds and healthy fats. No meat, egg or dairy. You can say it is a plant-based diet. Paleo diet will take you to the era before farming was invented. It is also known as caveman’s diet. Foods included are fruits, non-starchy vegetables, wild caught fish, seafood, lean meat, eggs, seeds and nuts. Sugars, processed fats, grains, dairy, high-fat meat, milk and legumes are not part of this diet. Although both vegan and the paleo diet are two ends of the spectrum, one thing is common that both the diet plans make you consume a healthy dose of fibre. This, in turn, reduces the level of blood glucose and cholesterol. In the last few years, both diets have become popular. To know how both might affect our health let us discuss their pros and cons. The concept behind the paleo diet is to eat foods that can be gathered or hunted. Wild caught meat is one of the best sources of protein, omega-3 fat. Fruit and vegetables supply the required vitamins and minerals. Promoters of the paleo diet claim that those who follow it are less are the risk of developing obesity and autoimmune disease. Also, this diet helps to lose weight and maintain lean and robust physique as it eliminates refined carbohydrates. The minus point of this diet is that it make you consume too much meat. This diet is high in protein, but the amount of cabs is fairly restrictive. Not many foods are approved, and also the portions of approved food are not specified thus you may overeat. This diet eliminates grains that is a good source of energy. It also eliminates dairy that is a rich source of calcium. It is a strict diet for vegetarian that will leave them protein deficient. Few animal substances prove toxic for example pork, for example, carry the parasite and shrimps are bottom feeders and the most poisonous seafood. Thus, it better to avoid shrimp and pork. If you want to go for a paleo diet better choose organic and grass-fed products. Modified paleo diet also includes gluten-free grains, for example, rice and grass-fed butter. The vegan diet is rich in vitamins, minerals and enzymes especially if it is eaten raw nutritive value is high. It improves the energy level and alkalizes the body. Promoters of the Vegan diet claims that it lowers the risk of obesity, boosts immunity and increases longevity. A vegan diet eliminates saturated fat that is obtained from the animal food product. As vegans do not consume dietary cholesterol, the risk of heart diseases lowers. The minus point is vegan diet does not provide enough vitamin B12. Also, you don’t get enough amino acid, and vitamin D. Some vegan followers also suffer from iron deficiency. However, we also have some strict vegans whose digestive system develops healthy enough to produce a sufficient amount of essential B vitamins. Those who are on a strict vegan diet need to take a good quality vitamin B12 supplement, or B complex and protein powders. Also, it is recommended to eat a varied diet to provide adequate nutrition. To get adequate protein include nuts, seeds, soy, legumes in your diet. Add green leafy vegetables and soy milk to diet to prevent deficiency of calcium. Expose your naked skin of arms and legs to morning sun for at least 5-10 minute daily to get adequate vitamin D. For the proper supply of iron supply, eat green leafy vegetables such as kale, spinach dried beans, raisins and blackstrap molasses. 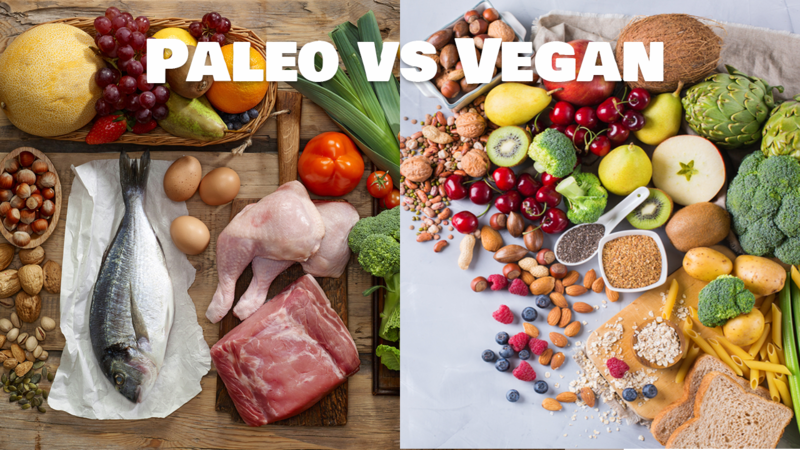 Both paleo and vegan diet eliminates processed food, refined sugar and unhealthy fats. Both are healthy if you make sure your body gets the recommended daily dose of nutrients and yes eat balanced.